A couple of times a year, my team at work volunteers with a different not-for-profit around Atlanta. 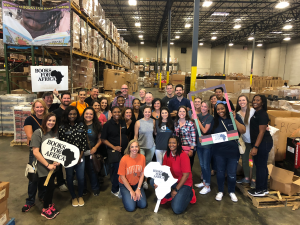 Last month, we spent a morning with Books for Africa (BFA) – an amazing organization that does just what it says – sends books to Africa. And, since this is a blog for people who love books, I wanted to share a literary volunteer opportunity with you! Americans throw away 320 million books a year. 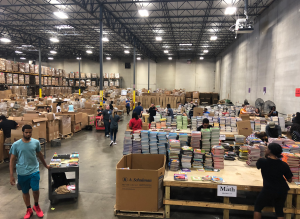 For 30 years, Books for Africa has worked to redirect this waste into the eagerly awaiting hands of children, teens and adults on the other side of the globe. Sadly, what BFA calls “a book famine” is the stark reality for too many people. BFA partners with school libraries, orphanages, adult literacy programs, and community resource centers to supply books of all types to children and adults. As volunteers, we sorted books that had been donated – weeding out books that were damaged or inappropriate (don’t need cook books or latest diet fad!) – and then organizing them by age group and subject. Some of our volunteers also started packing boxes. There’s a number of ways to support Books for Africa, and they have two locations – Atlanta and St. Paul. There is complete information on their website. Now serving nearly 60 countries, Books for Africa delivers 3-4 million books a year, promoting literacy, instilling critical thinking skills and fostering empathy and democracy in ways only a love for reading can do.